Teflon®FEP Gas Sampling Bag is made of Polyperfluorinated Ethylene Propylene(F46), film thickness is about 0.07 mm(called Teflon FEP by DUPONT USA). FEP film is the most chemically resistant film in the fluoropolymer family, low adsorption. 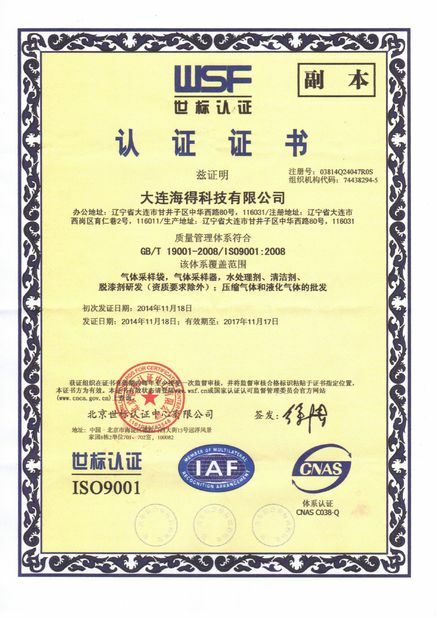 The melting temperature of FEP film is 260℃, so the difficulty of sealing for FEP is far greater than PVF(Tedlar) and PVDF(Kynar), our company successfully resolved the problem of difficulty heat seaing for FEP in 2003. Teflon®FEP is one of the most chemically inert materials for making gas sampling bags. It works well in extreme temperatures ranging from –400° to 400°F; allowing it to be used in most stack sampling conditions. 5-mil FEP film is completely resistant to the most severe corrosives. Relatively low permeability results in minimal sample loss. FEP bags can be specified for applications involving rough handling. superb resistance to chemicals, strong acid, strong alkali, strong corrosion and organic solvent, low adsorbability. 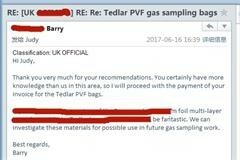 Standard Teflon®FEP Gas Sampling Bag Sizes: 0.5L, 1L, 2L, 3L, 4L, 5L, 8L, 10L, 15L, 20L, 30L, 40L～6000L or customized size. Teflon®FEP Gas Sampling Bag is suitable for high accuracy PPM and PPB analysis sampling, it can collect and save all kinds of strong corrosive and high chemical activity of gaseous, liquid samples and VOCs samples. Our FEP gas sampling bags are available with different valves and fittings and can meet a wide range of applications in environmental protection industry. 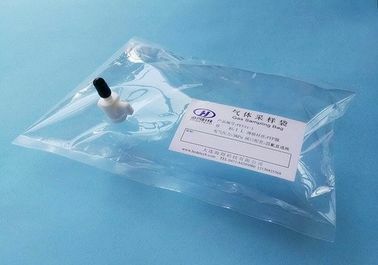 Operating temperature: Working temperatures should be -60°C to +150°C for PTFE connector and -20°C to +80°C for PC stopcock valve. 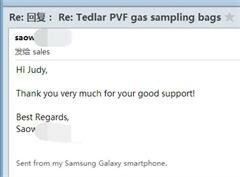 The sample gas in sampling bag to save time should not be too long, specific saving time depend on detection limit of experimental analysis requirement, gas component species, temperature and humidity, pressure, etc: generally, for pure inert gas, sampling bag can be used as a temporary storage container and recommended storage time less than 72 hours; for standard gas, flue gas, ambient atmosphere, recommended storage time less than 24 hours. Avoid filling pressure higher than 6000Pa, fill gas until the bag is fully expanded, however, it is not so tense when you press it using your finger. The overpressure filling can cause gas sampling bag burst damage. When sampling and cleaning,please do not exceed 80% of the calibration volume, take 1L sampling bag for example, suggest sampling volume is less than 0.8 L.
There must be a blank sample compare for precise experimental analysis to do background deduction. For negative pressure gas, should be sampled by appropriate power and flow rate vacuum pump. For the gas containing particulate matter, dust and aerosols, should adopt filter to prevent polluting the sample bag, then difficult to clean.